On this New Year’s Eve, what could we hope for as a blessing? The rain was drizzling in the late afternoon. My husband and I were bringing Christmas flowers to our son’s grave. We walked silently through the Resurrection Garden until we came to the place we now know so well. 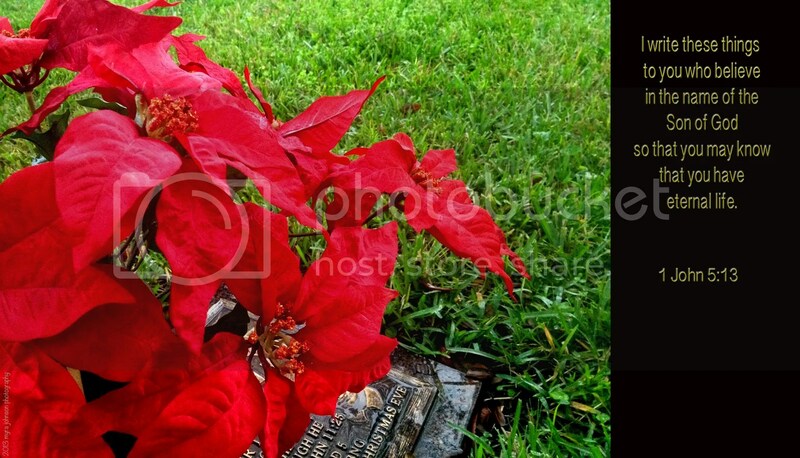 Adjusting the red poinsettias in the vase of the gravestone, we looked at the familiar pictures embossed there. I spoke three words to my husband–"He isn’t here." Bringing flowers to the cemetery serves only as a reminder of the great love we have in our hearts for our teenaged son. It is also a reminder of who he was here on earth–playful, funny, smart. In the years previous, his funny and playful side would become evident at Christmastime. Having a little brother who was nine years younger, our son decided to purchase some "cowboy" western items and place them under the tree for him. Were they signed with his name as the giver? Instead, he would write, "From the Cowboy of Christmas Eve." Since this was such a meaningful thing to us, we had it written on the gravestone. The Cowboy of Christmas Eve is not with us here, anymore. The pain of missing him can spring up at any moment, yet it is always met head-on with the assurance that he is with God in Heaven. 1 John 5:13 says, "I write these things to you who believe in the name of the Son of God so that you may know that you have eternal life." When he died, the Cowboy of Christmas Eve recieved the greatest gift possible from his Heavenly Father–eternal life with Him. There is a room in the church that is used for various things. Specific areas can be transformed in moments to accommodate a Bible study or an indoor ball game. With the proper technology in use, multimedia presentations are even possible. 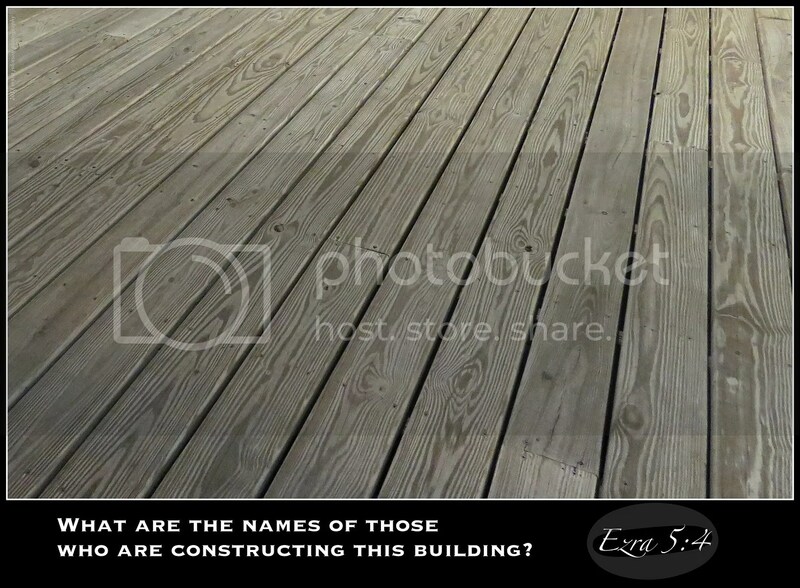 There is one area in particular that is used as a platform or altar. Pillows line the floor, ready to be filled with knees bowed in prayer. How many petitions and words of praise have been uttered from there? How many people have knelt with hearts longing to connect with God? I will never know, but God knows. Like Paul, God knows how often we pray. He knows how often we pray and He knows what we have prayed for. Those who have knelt on the pillows may not remember in years to come what they prayed about. Their prayers, however, will be remembered by God for eternity. Your prayers will be, too. 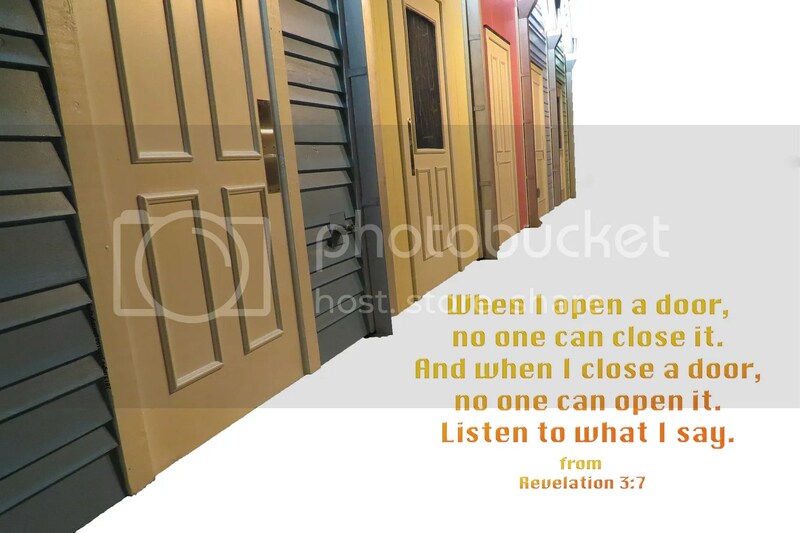 Although I understand that Jesus was speaking to a specific group in this passage, I find that the idea of an open door and a closed door is reassuring. If Jesus is opening a door for us to walk through, who is there who can get in our way and shut it? If Jesus is closing a door so that we may not enter, who is there who can open it? "And if our God is for us, then who could ever stop us? And if our God is with us, then what could stand against? We can rest in knowing that God wants what is best for us. 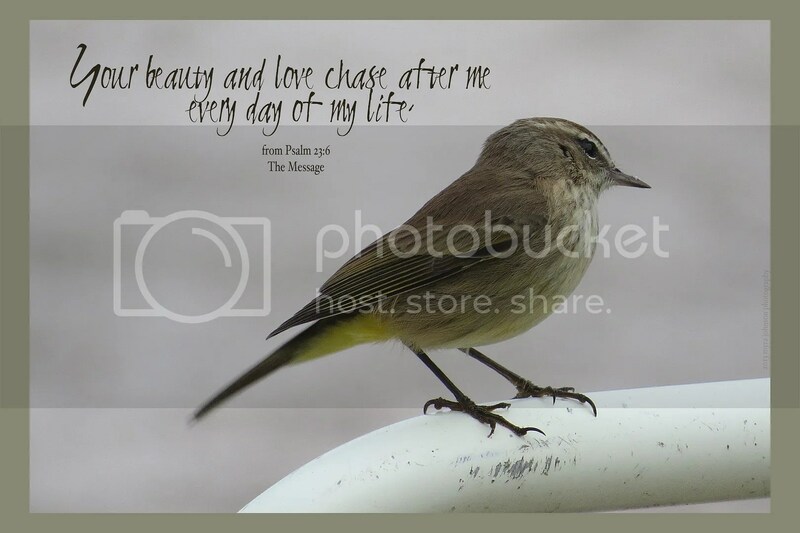 1 Chris Tomlin "Our God"
the ruler of all the earth! What will choirs in Heaven be like? I’ve seen small choirs in a church before. 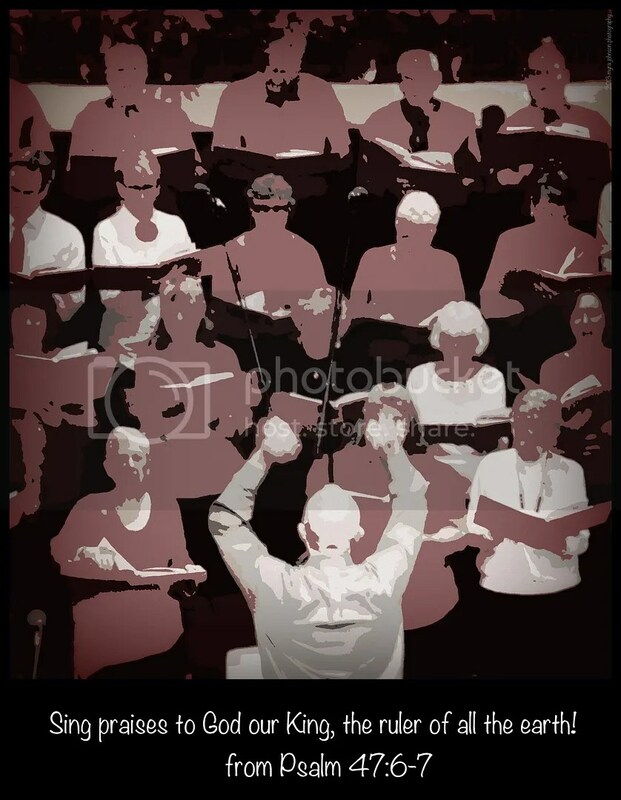 I’ve seen large choirs in churches, too and in secular settings, as well. The actual sound of many voices uniting together is a wonderfully unique thing. The fact that many voices can choose to unite together to sing praise to God allows me to consider that doing so is an ordained act. There will surely be choirs in Heaven singing praise. With human voices free from sin being joined by angels’ voices, the sound will certainly be the most glorious blend of praise we could ever have imagined! Then Zerubbabel son of Shealtiel and Joshua son of Jozadak set to work to rebuild the house of God in Jerusalem. And the prophets of God were with them, supporting them. At that time Tattenai, governor of Trans-Euphrates, and Shethar-Bozenai and their associates went to them and asked, “Who authorized you to rebuild this temple and to finish it?” They also asked, “What are the names of those who are constructing this building?” But the eye of their God was watching over the elders of the Jews, and they were not stopped until a report could go to Darius and his written reply be received. Can God make a way for you even in the midst of opposition? When it seems that you do not have the talent, the education, the funds or the wisdom to move ahead? Can He make a way when those in authority seem to be against you? What if the opposition is unseen–like a heavy discouragement within? For the last couple of nights, I have been reading the account in the book of Ezra of the rebuilding of the house of God in Jerusalem. Zerubbabel and Joshua were doing the construction. 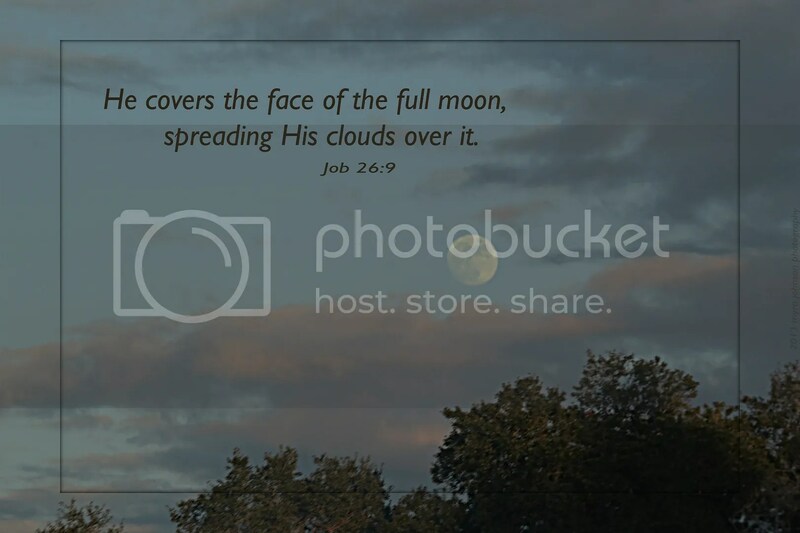 There is a very important statement in this scripture passage: But the eye of their God was watching over the elders of the Jews, and they were not stopped….. He is the same today as He was when these events occurred long ago. If He wants to make a way for you to move forward in any situation, He will. Nothing is too difficult for Him. And when He makes the way, you will know that it was God who did. Christmas Day is almost over. In just over an hour from now, it will be "the day after" Christmas. There will be "after Christmas" sales at stores around the world. Long lines of customers will wait to return gifts on this day "after Christmas." There will even be "after Christmas" parties planned. But what will it mean to us? Will we forget the meaning of Christmas Day quickly and revert back into our previous mindset, or will the fresh reminder of the greatest gift to all mankind stay with us and linger on? A family dinner out and a Christmas movie to watch at the theater in another city. As we drove down the highway, we passed through a town that had a beautiful display of Christmas lights at their welcome center. Later on in the evening on the way home, we stopped to visit and look around. Thousands of lights graced every tree and bush, it seemed. Walking around the myriad of glowing bulbs, I noticed an area that was different than the rest. Right in the front, in full view from the highway, was a nativity scene. Pausing to look at it, I decided to photograph the illumined figures. Silently, they told a story. A testament to the birth of Jesus. Shepherds came to see Him. Wise men came to see Him. They were blessed to look upon the newborn Savior of the world. 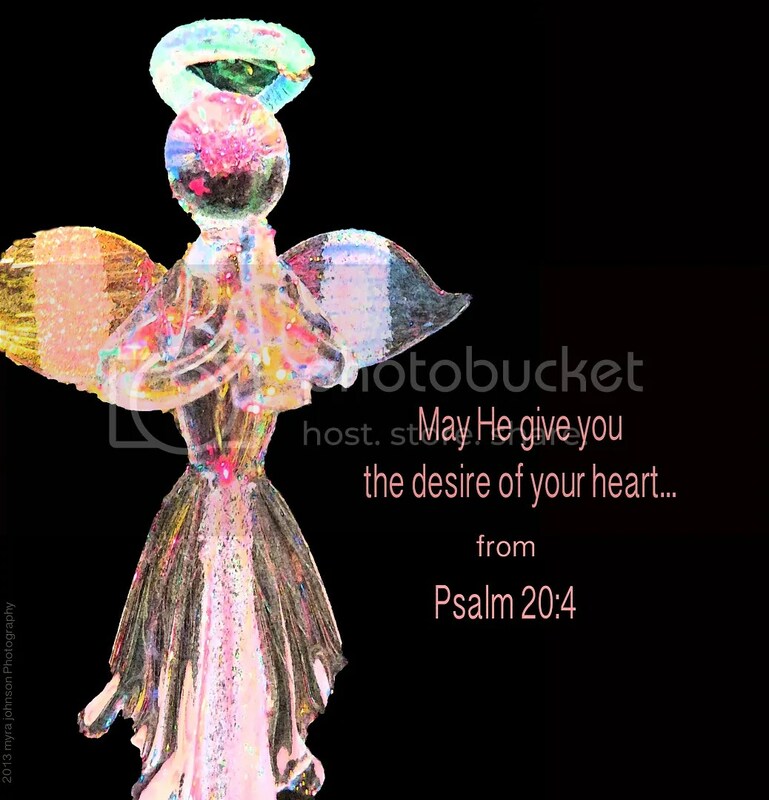 This Christmas, will we seek Jesus in our hearts? Will we show kindness and love to others, as He would have us to? On coming to the house, they saw the child with his mother Mary, and they bowed down and worshiped him. 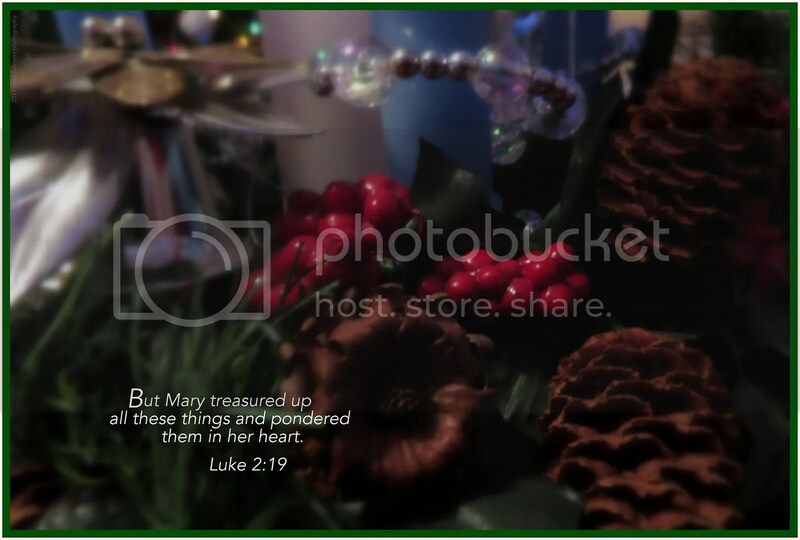 Then they opened their treasures and presented him with gifts of gold, frankincense and myrrh. The Messiah would someday come to Earth. 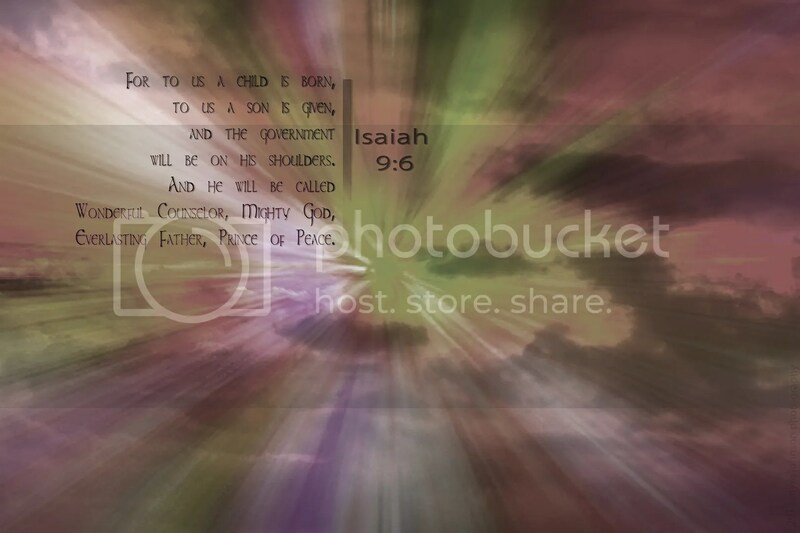 The people of God longed for that day. They hoped for that day. The magi from the east believed the prophecy. With their hope and faith alive in their hearts and the star in the sky to lead them, they traveled to see the newborn Messiah. 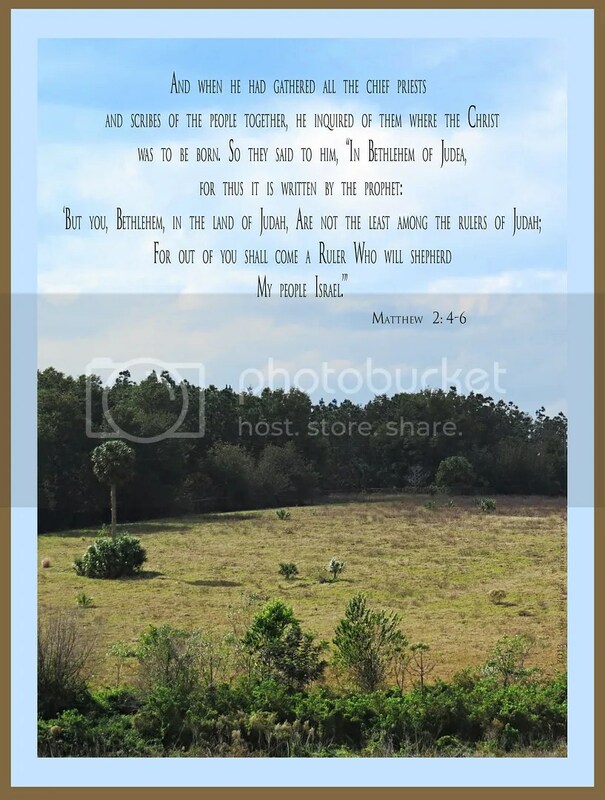 Jesus will one day return to the Earth to gather His own. Many long for that day. Many hope for that day. For to us—you, me, your parents, your grandparents, your great-grandparents and your entire family line–a child is born. And not only to our family lines but to everyone else’s, too. A child is born–He will reign forever. Is there comfort for you this Christmas, realizing that a child, Jesus, was born to live on Earth and one day purchase a place in Heaven for you? 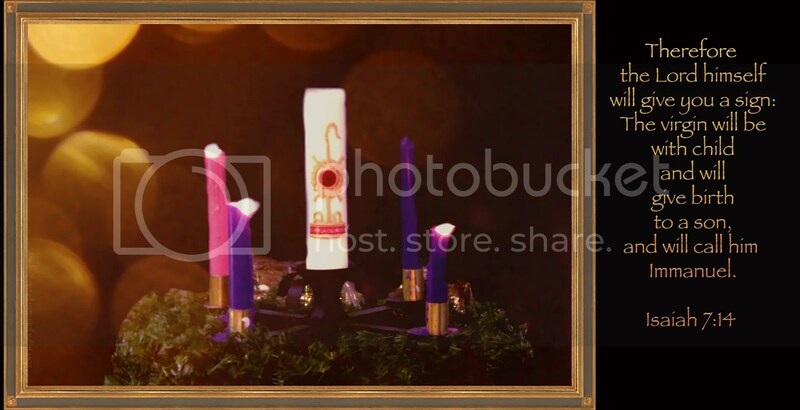 The Advent candles remind us of Jesus and how He came to Earth. Leaving Heaven, He came here—to live among us and to save us. The gift of redemption offered to all. The horn lay still on the chair after the Christmas program at church. Moments before, a young lady had placed her lips upon the mouthpiece, filling its many tubes with air. Her fingers pressed the valves as she chose the appropriate notes to play in praise with the rest of the musicians. As each person sang, spoke or played an instrument, it was done with love for God. Hallelujah! Yes, praise the Lord! Praise him in his Temple and in the heavens he made with mighty power. Praise him for his mighty works. Praise his unequaled greatness. 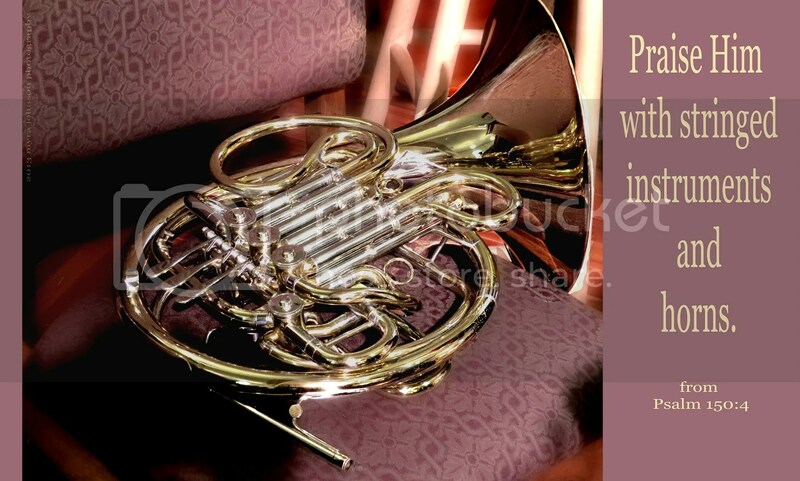 Praise him with the trumpet and with lute and harp. Praise him with the drums and dancing. Praise him with stringed instruments and horns. Praise him with the cymbals, yes, loud clanging cymbals. Let everything alive give praises to the Lord! You praise him! There is a pond down the highway from my house. I guess it’s just habit to turn and look at it when I am driving by. This time, I noticed a flock of birds that had settled into the water. The scene drew me back and I found myself taking in the view a little closer with my camera in hand. Not really knowing social protocol for these particular birds, I can’t say that my thoughts about them are a hunded percent correct. It seems to me, though, that they were all getting along quite well during their little visit to the water. After all, if you were one of them—long orange beak, etc.—you were one of them. Is that how it should be with Christians? We should love all people, because God loves all people, but all people may not love us in return. But what of the relationships between Christians and Christians? 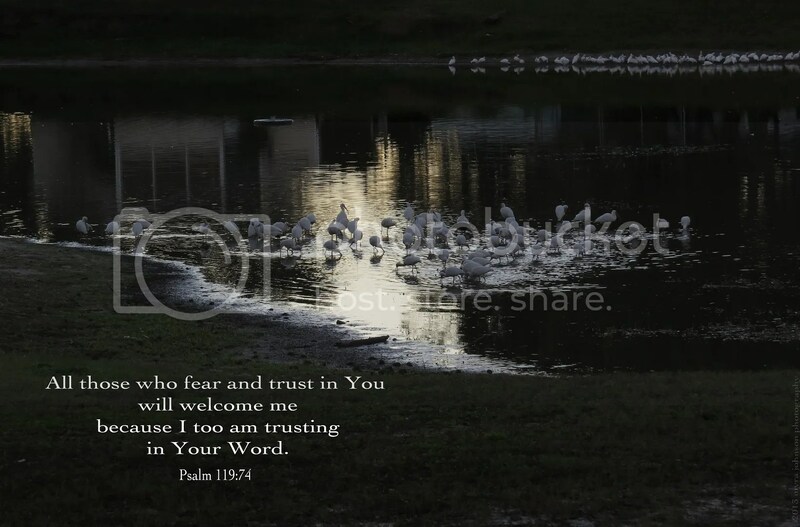 All those who fear and trust in you will welcome me because I too am trusting in your Word. As Christians, are we always open to welcoming others who trust also in God? As we share a common love for God and a common salvation, should we not also share a common unity? After all, if we’re one of those—those forgiven, dearly loved, adopted back into the fold children of God—we’re one of those. And if you’re one of those, too, don’t we belong together, welcoming each other? Are you in the midst of a storm right now? Just look at the size of those waves! With fear welling up in your heart, you may doubt that you’ll reach the shore. What if the boat capsizes? The flashes of lightning streak across the sky as the thunder rumbles around you. God is aware of the storm you are in. No GPS could track you like He can. He is totally aware of your location and your situation. God can calm the storm. He’s the only One who can. 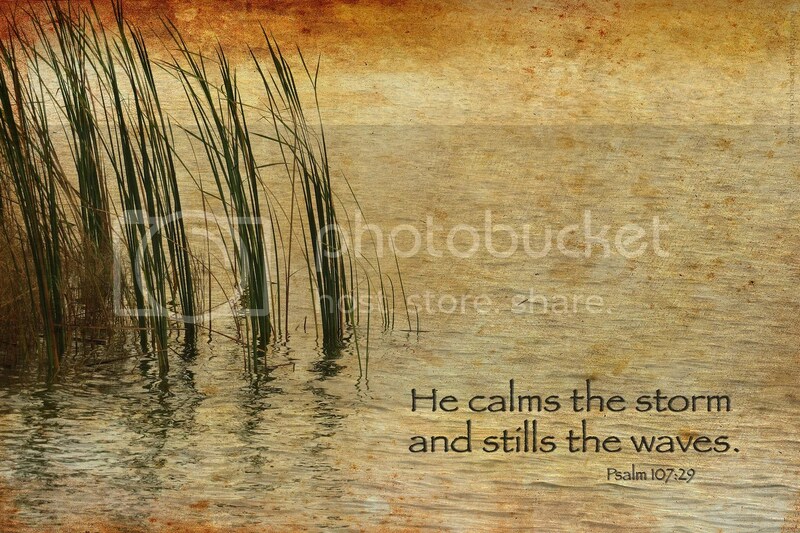 He calms the storm and stills the waves. I was just standing there, looking past the lawn chairs on the grass at the hotel. Suddenly, a little bird came to rest on the top of one of the chairs. An unexpected photo shoot took place in the next moment as I clicked away, capturing him in one pose and then another. How delicately yellow he was, mixed with feathers of tan and ivory! Sometimes God places His marvelous works right in front of me, calling my attention to the beauty and detail in it all. Those times are gifts from Him, bringing joy to my heart. The sun and the moon were visible at the same time as I strolled on the boardwalk at the lake. As the greater of the two made its way past the western horizon, the lesser rose higher and higher. With complete perfection and mathematical accuracy, the earth and the moon move to a dance set in place by their Creator as the sun spotlights the performance. How great and awesome is our God! God sent the angel Gabriel to Mary. As he greeted her, to addressed her as one who was highly favored. He told her that the Lord was with her. Can you imagine what it would have been like? From these moments on, Mary’s life was filled with the knowlege of the presence of God. An angel from Heaven visited her. All that he foretold came true. Jesus was born and she watched as He matured into a man. She watched as He began His ministry. She watched as He healed the sick and delivered others from demons. She watched as He suffered and died on the cross. 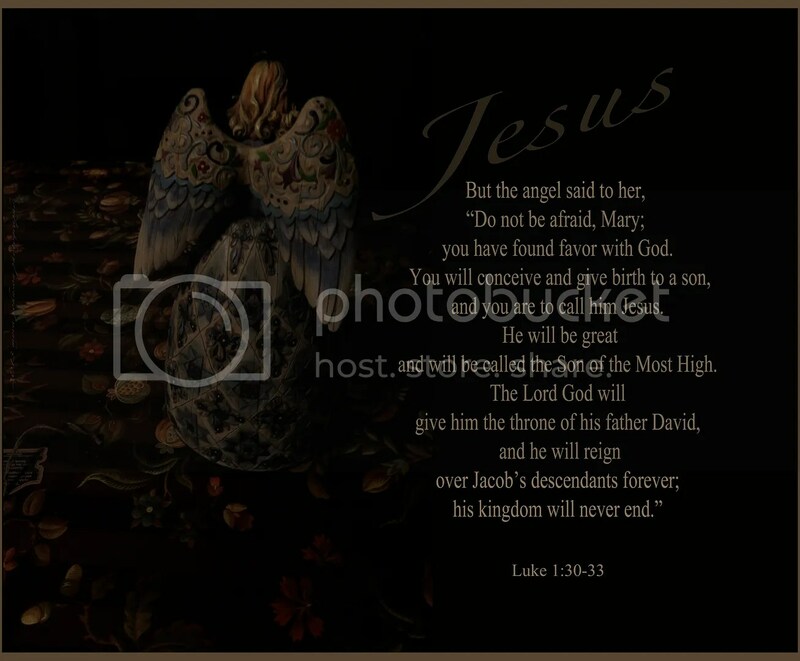 The plan of God to save the world, beginning with the birth of a baby boy….. This past week, my family experienced a miracle. We had been praying for about a month with a specific concern on our hearts. Let’s just say that it was too big for us to just "take care of" ourselves. During the past month, I was looking online for a scripture and happened to see a verse about being silent. It seemed to jump out at me. It was Exodus 14:14 from the English Standard Version of the Bible. This week, God answered our prayers and wiped the concern away. Our hearts have been rejoicing ever since! Today, as I walked through a store, my eyes were drawn to a wall hanging on display. I struggled to choke back immediate tears. There before me were similar words to what I had seen online. God reminded me, once again, of His great power. 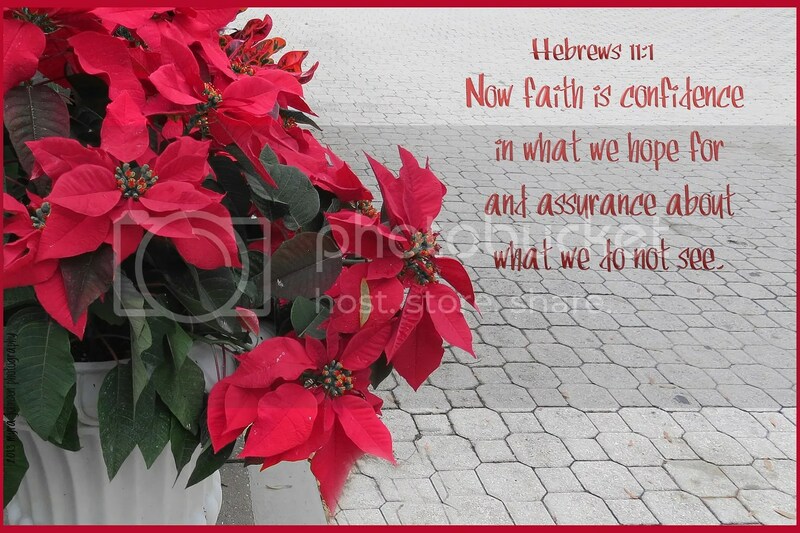 Nothing is too difficult for God…..
Jesus came to Earth right on time. Exactly when He was supposed to come. The time and the place had already been selected. 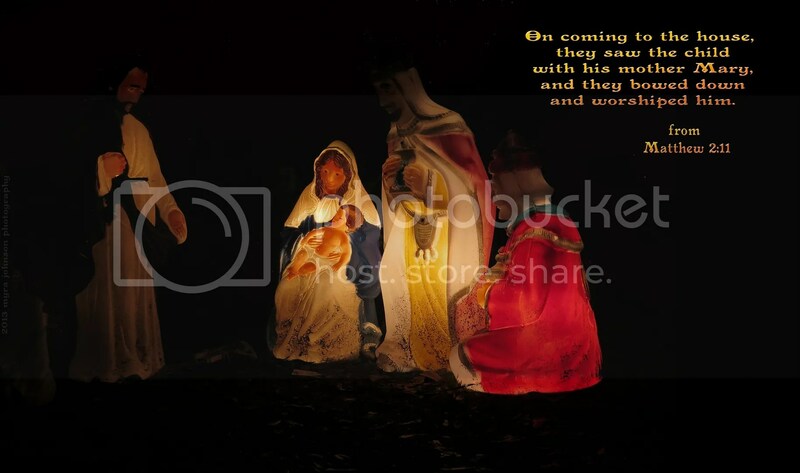 As the wise men came to see baby Jesus, King Herod was disturbed. He even instructed the wise men to let him know when they found Jesus so that he could go and worship Him. This was not Herod’s intention at all. Joseph was warned in a dream to take Jesus and His mother, Mary, to Egypt until he received another message, because Herod would want to find Jesus and destroy Him. Time is in His hands. As it was two thousand years ago, what He has determined to happen will happen. While changing out some light bulbs in a lamp, my eyes were suddenly drawn to a picture hanging on the wall nearby. 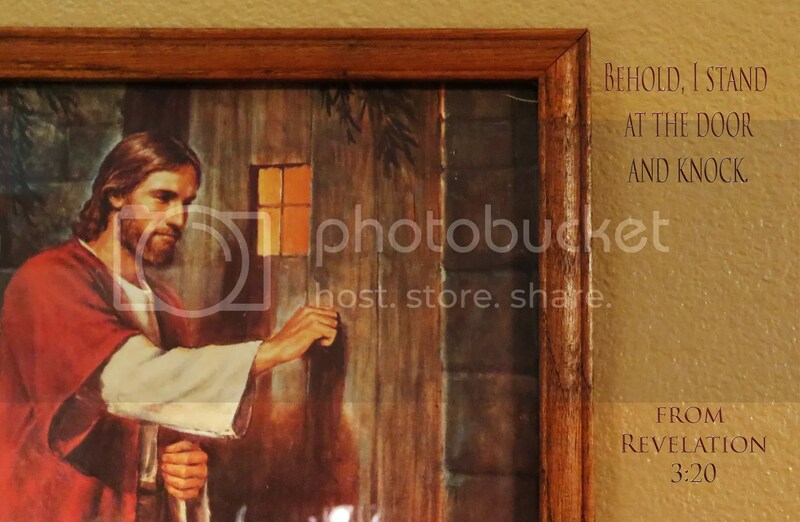 It was a framed picture of Jesus, standing at a door, knocking. I smiled because He was smiling. Many years ago, I had given the picture to my youngest son when he accepted Jesus as His Savior. In this depiction, Jesus’ face looks kind and happy—expectant. Jesus knows the wonderful things He has to give to the person on the other side of the door. Eternal life forever with Him. Is Jesus knocking at the door of your heart today? Why don’t you let Him come in? The bridge was tall and strong. 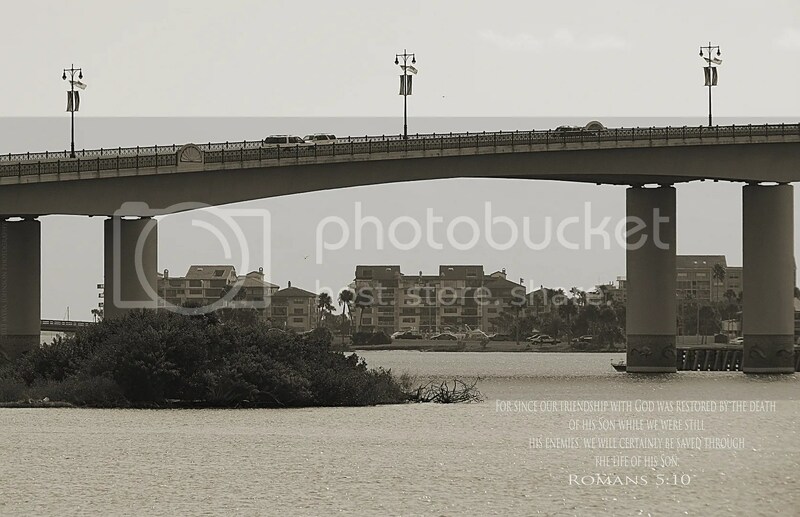 Cars passed freely on its pavement, high above the water below. Jesus is, in a way, like that bridge. We are separated from God because of our sin. Sin is like the water, creating a gulf between us and God. When Jesus came and died for us on the cross, He became a bridge–a passageway to God. Our sins can now be forgiven and we can pass freely to God, high above the condemnation we deserve. I hadn’t planned on stopping at the park. It had already been a busy day and it wasn’t even noon yet. Even so, I made a snap decision and parked my car on the side of the road. Grabbing my camera, I walked to the water’s edge and simply took it all in. A family was walking together on the other side of the lake. Another group of people were eating at a picnic table nearby. Birds flew almost effortlessly across the water, creating a mirror image of motion and color. All that I experienced was a gift from God. Taking a few moments to stop and enjoy His gift before going home, I had accepted a blessing that I coud have easily missed. 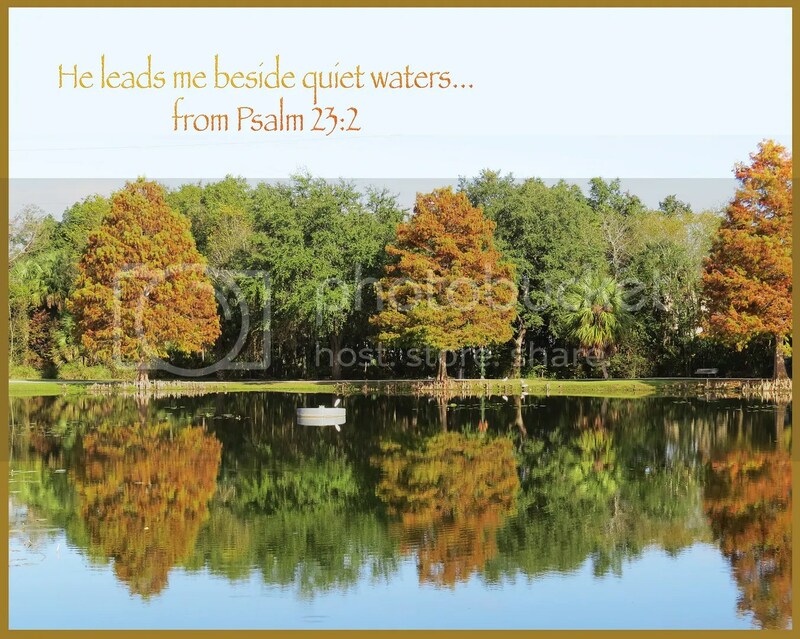 Sometimes God leads us to quiet places.